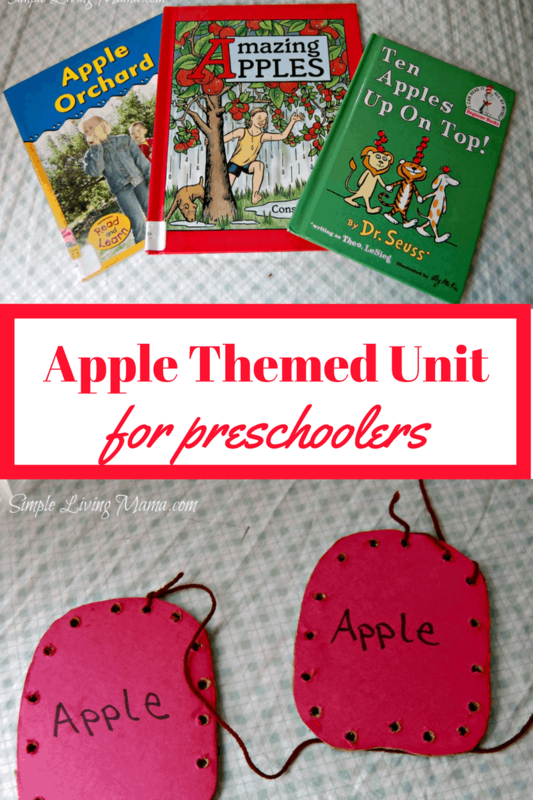 Fall is the perfect time to do an apple unit study for preschoolers. September was our apple month, so I thought I would show you what we did to learn a little bit more about apples in our homeschool preschool! The first thing I did was hit up our library and attempt to find some apple themed books that were age appropriate for Bug. Surprisingly, their selection was pretty slim, but we worked with what they had. The first two books pictured above were about the growing and harvesting of apples. They were actually pretty interesting to both of my kids. 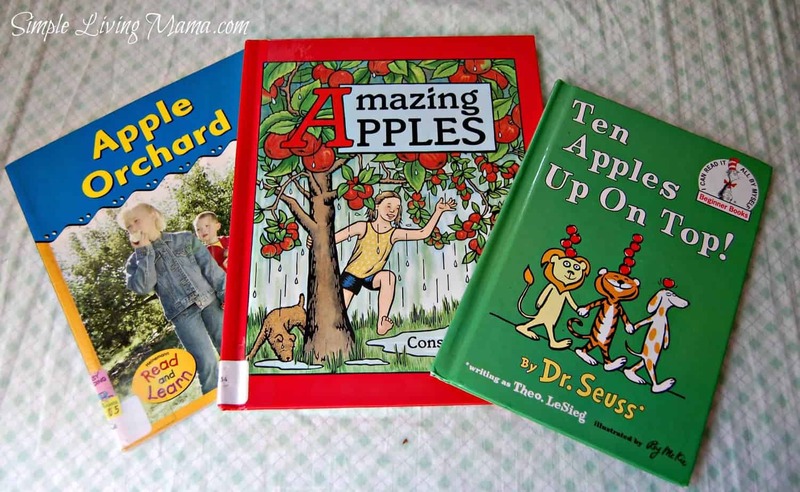 We happened to have Ten Apples Up On Top in our home library and it was a fun read! 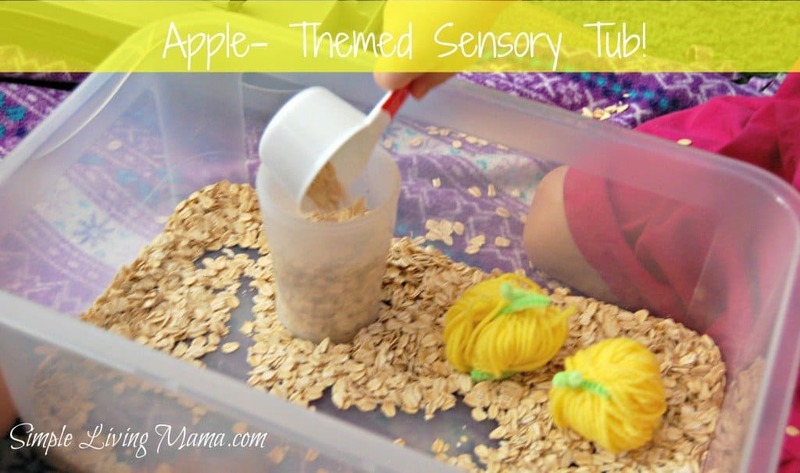 You may remember our apple themed sensory tub. I’ve got to say, that was the biggest hit out of our entire unit study by far! 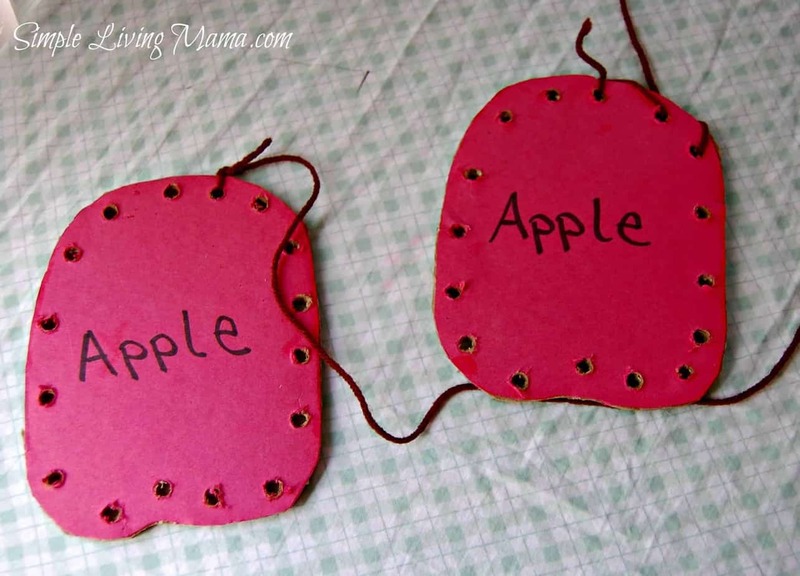 I was really excited to make some apple lacing cards for the kids. Did you know that it is so simple to make your own lacing cards? These didn’t cost me a thing. I drew an apple shape on some construction paper, cut it out, and glued it down on a piece of cardboard. Then I cut out the cardboard/construction paper apple shape. This cardboard was pretty thick, so Mr. Simple used a drill to drill holes all around the outside of the apple shape. I cut a long piece of yarn and knotted it to one of the holes in the apple. Then I wrapped scotch tape around the other end of the yarn to make it sturdy for lacing. So simple! In the picture above you will see a fun activity that was really easy to put together. 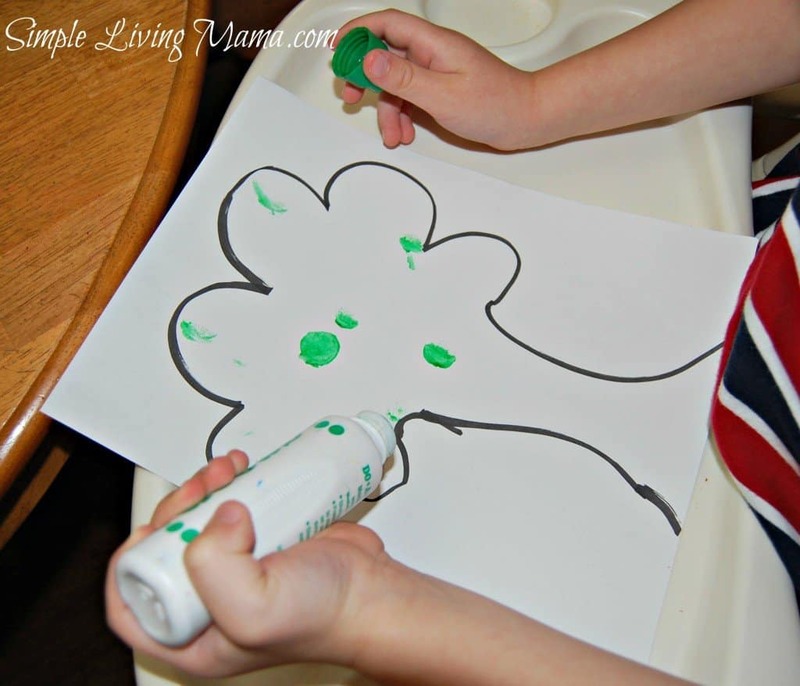 I wanted the kids to use their Do-A-Dot markers to put apples on a tree. At the time, my printer was down so I drew a (wonky) tree shape on a plain piece of paper. I was going to color the tree, but the kids saw what I was doing before I finished and could not wait to get out their markers and place the apples on it. We talked about the different colors of apples and we also counted a few of the apple dots before there were way too many on the tree! 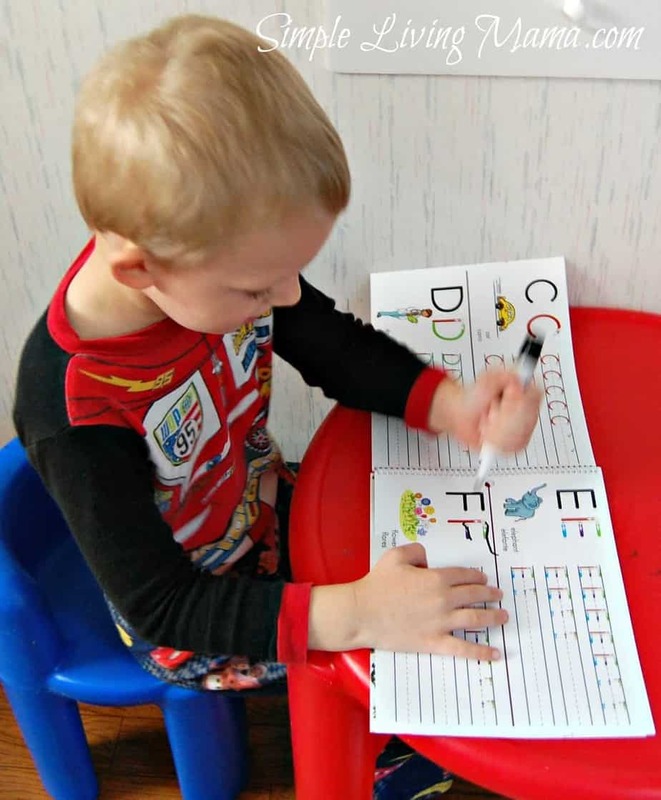 Above is a picture from Bug’s workbook. 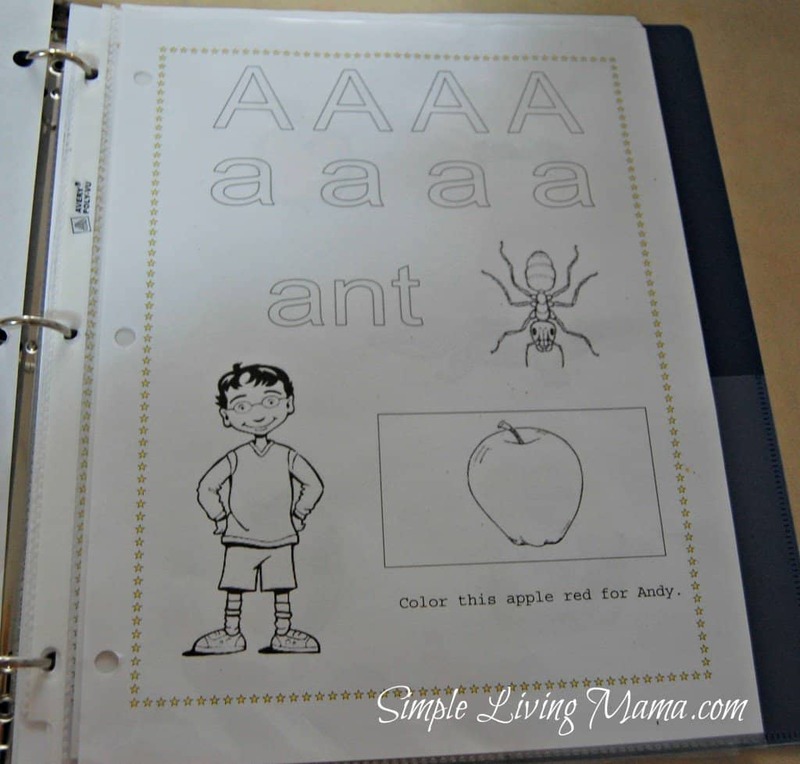 We were studying the letter A and of course apples are the quintessential real-life symbol for the letter A. I use sheet protectors and dry erase markers with these worksheets because then they become reusable! Finally, we decided to work on some letter tracing. As you can see, Bug wanted to trace the letter F, but we did work on tracing the letter A several times. I’m still working with him on holding markers, pencils, and crayons correctly. I don’t know if it’s because he’s a lefty that he’s having problems, or what it is, but we are working on it. So, that is pretty much what we did for our apple unity study. Of course, we ate a lot of apples, too, but my kids love apples all year! Great setup here! 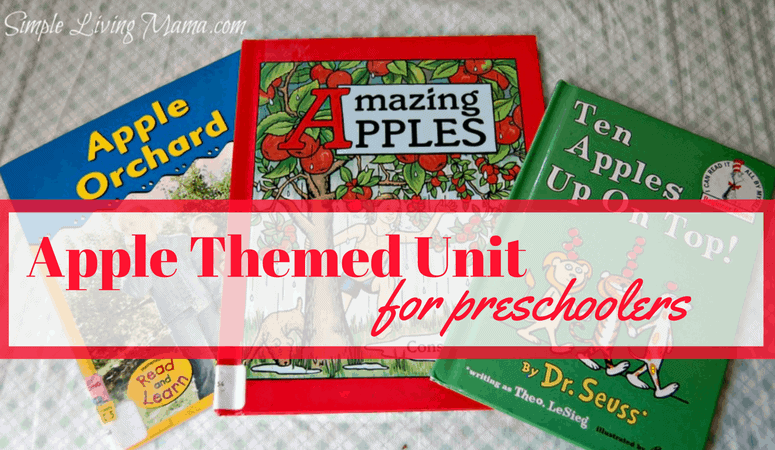 Apple themes are always a hit with my kiddos – I’d love for you to link up to my book hop as I loved your apple books – ten up on top is one of my personal favs! Will do, Marissa! Thanks for stopping by! Joanie, we are so similar in our approaches! I love when you share from your “preschool days.” 🙂 Pinned this for later reference!